One of the main reasons why an increasing number of travellers from Europe and overseas are choosing Slovenia for their weekend city breaks is the undeniable beauty of its capital, Ljubljana. 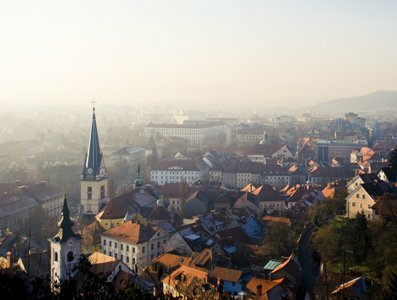 Home to several worldwide-recognised arts and music festivals and displaying a surprising mixture of architectural styles, Ljubljana’s city centre welcomes visitors with open arms and invites them to explore the town along with the many green spaces that earned it the European Green Capital Award in 2016. The nearest airport is Jože Pučnik International (LJU), situated 24 kilometres from the centre and operational base of the Slovenian carrier Adria Airways. Whether you travel to Ljubljana to attend a festival, to take part in a congress at its Exhibitions and Conventions Centre or to disconnect as a tourist, by staying in the heart of the city you will be able to walk to most of its attractions and go on sightseeing tours at landmarks such as St. Nicholas’ Cathedral (impossible to miss because of its green dome and twin towers spotted from the distance), the Town Hall, the Ljubljana Castle –reachable by riding a funicular that departs from the central square-, the Tivoli City Park, the Ljuljanica River, the Triple Bridge and the Dragon Bridge, among others. Below, you will find our recommended accommodation in Ljubljana –Slovenia– sorted out by category, in such a way that it will be easy for you to choose a bed and breakfast or hotel in the downtown that is close to your interests and fits into your travel budget. The Atticus is a 2-star hospitality establishment particularly recommended to backpackers and travellers on a budget who want to stay in Ljubljana downtown and enjoy everything the city has to offer during a short stay. It has such an optimal location that guests can walk to some of the most popular bridges and the central railway station, and even admire the fantastic views to the Ljubljana Castle from their rooms. What is more, this bed and breakfast in Ljubljana provides free WiFi and air-conditioned rooms for solo travellers, couples or families that may feature en suite bathroom or grant access to a shared one in the corridor. Fridges and coffee facilities are made available for visitors to use. Although the vicinity has lots of cafés and restaurants, former guests report having had a great time at the onsite garden bar meeting up with other travellers. A continental breakfast buffet including gluten-free and vegetarian options is served every morning. If you love city trips and want to get the coolest Instagram pictures at the best spots, this might be the perfect place to stay, plus it offers good value for money with affordable nightly rates. The town hall, the cathedral, the popular Triple Bridge as well as the Dragon one, the central market and the central square -from which you can commute to the top of the Ljubljana Castle-are all within a short stroll from the hotel. Besides, this hotel in Ljubljana city centre goes the extra mile in order to make your trip a perfect one: complimentary bikes are available for you to explore the city, airport transfers can be booked for a small surcharge, the free WiFi network is active in the entire premises and breakfast may be included in the total price per guest. The rooms are fully equipped with flat-screen TV, safety deposit box, work area and private bathroom with shower. Additionally, if required you will be given access to their meeting spaces, a lounge and the summer terrace. For a bit more luxurious stay in Slovenia, you are advised to choose the Lev hotel in Ljubljana city centre, equally close to all the main attractions in town and only 400 metres away from Tivoli City Park. All rooms feature free WiFi, air conditioning, TV, safe, mini fridge and private bathroom with amenities, and guests are invited into the onsite restaurant every morning to enjoy a hearty buffet breakfast at no extra charge. If you travel to Ljubljana for business purposes, know that you can host your event, work meeting or sales presentation on their designated space at the top of the building, which offers stunning views of the city. Private parking spots can be reserved at an extra cost and families may benefit from babysitting and cleaning services, organised tours, airport transfers and left-luggage.